Miki Kashtan is a co-founder of Bay Area Nonviolent Communication (BayNVC). She is the author of Reweaving Our Human Fabric: Working together to Create a Nonviolent Future, Spinning Threads of Radical Aliveness: Transcending the Legacy of Separation in Our Individual Lives and The Little Book of Courageous Living. 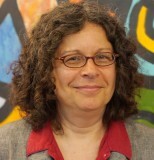 She is inspired by the role of visionary leadership in shaping a livable future, and works toward that vision by sharing the principles and practices of Nonviolent Communication through mediation, meeting facilitation, consulting, retreats, and training for organizations and committed individuals. Miki blogs at The Fearless Heart (separately from “Latest Posts” on this site, linked to below) and her articles have appeared in the New York Times (Want Teamwork? Encourage Free Speech), Tikkun magazine, Waging Nonviolence, Shareable, Peace and Conflict, and elsewhere. Find a full list of her published books and articles here. She holds in-person workshops and retreats in the Bay Area and other US locations, and in various other countries (see her calendar). She offers teleseminars herself and through the NVC Academy. She holds a Ph.D. in Sociology from UC Berkeley. Have you ever dreaded going to a meeting or watched in dismay as a group collapses into conflict? If you regularly find yourself working with groups, this intensive workshop can provide you with vital tools to support the effective functioning of any group. Learn a unique decision-making process, developed by Miki Kashtan, which can be used in emergency situations to reach a quick decision, to break through a bottleneck within a group, or throughout the lifecycle of a long-term project. Based on the principles of Nonviolent Communication, this process is fully collaborative and leads to decisions that allow everyone to be on board. Check Miki’s events on the calendar for current dates. The vision of Leveraging Your Influence is to integrate the three aspects of nonviolence – love, truth, and courage – into the very fabric of your everyday life so they can serve as the foundation and organizing principle of your work in the world. To “leverage your influence” is to access your own power and capacity for visionary leadership; to lead by example with care and empathy in service of creating a world that serves life — at home, at work, in whatever context. This means transforming conflict into deeper mutual understanding; building effective collaborations (and stronger families, communities, and organizations); and manifesting the vision of a world that considers the needs of all.